As we stepped into the Christmas month, Christmas 2010 is now really around the corner! Not surprisingly, a good number of Christmas 2010 deals are springing one after another from almost every popular China-based online shop targeting global buyers. Especially for wholesale stores whose major customer base is composed of merchants or resellers, it’s now the last and best chance to grab best deals for Christmas 2010. 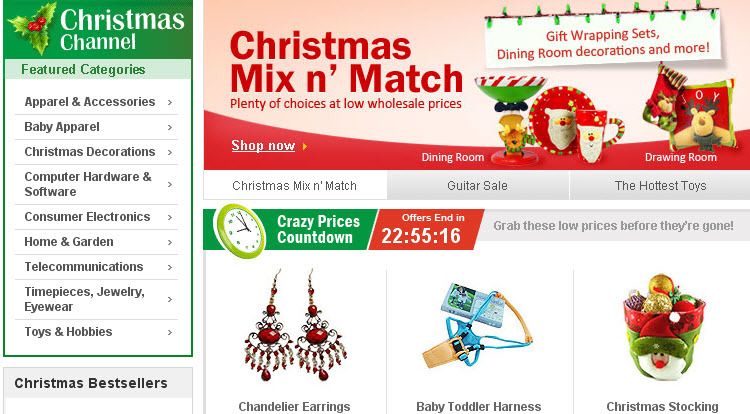 Unlike local retail stores, wholesale shopping websites generally launch their Christmas sales at least one month earlier. In this way, re-sellers have enough time to pick up the best supplies for their Christmas inventories. Likewise, these stores would save their biggest Christmas deals to early December, when Christmas is approaching in just one or two weeks. For those who still haven’t sourced enough Christmas supplies for the grand festival, don’t miss out this valuable opportunity to get best Christmas 2010 deals and maximize your profits. To help interested parties find out Christmas 2010 deals available more quickly, we have collected the latest Christmas sales and will show them below – all from trusted and popular Chinese online stores. Check them out! Winter Formal Dresses That Make You Look Glamorous This Festive Season Is Milanoo Scam True or Not?